Colombian rivers are unique ways to experience the country’s biodiversity and local communities. This day trip takes you to the Río Calderas, located east of Medellin. Enjoy at least 3 hours of exhilarating, intermediate whitewater ( Class 3/4). 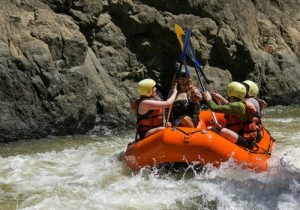 Whitewater rafting is a full body physical activity. You will be paddling actively, raising your heart beat, and potentially swimming in fast moving water! 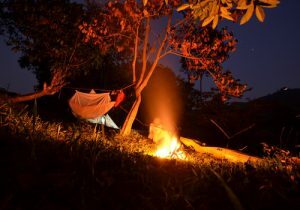 Paddle though the Jungle and get an incredible perspective on the Colombian back country, while located only 1.3 hours from Medellin. 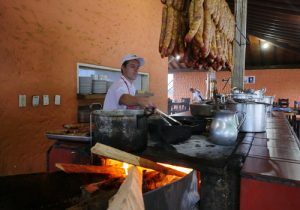 Closer than Guatape, yet much more adventurous and authentic! Reach the take out and celebrate with a cold drink! Meet your professional guides and safety kayaker 8 a.m. at our offices near Poblado (Cra. 43e #11a-13, Medellín). Start a scenic drive for 1 ½ hours towards the east. Arrive to the and begin a safety talk by the river to earn about hydrology, river hazards, and rescue techniques. Begin an adventurous descent on class 3/4 intermediate, but thrilling whitewater, flowing in a pristine valley. Look for wildlife and enjoy the chances to swim in the calmer sections. Relaxing on a secluded beach for a freshly prepared traditional lunch. The last part of the river is the most exciting, with drops up to 1.5 meters and fun waves to hit! Let our expert guides navigate with you safely the rapids before reaching the take out, where the local “tienda” awaits, packed with cold drinks! Our luxury vans and profesional drivers will take you back to Medellin (2 hour drive), you can gaze out of the window to the epic landscape or take a power nap! * MEET US AT THE RIVER: If you want to enjoy lower price, or if meeting us directly at the river is more convenient for you, this option is for you! Meet at 10 AM in “La Pinuela” , Medellin-Bogota Highway, at the Restaurant ” EL PALACIO DE LOS FRIJOLES”. 100% deposit must be made 2 days before the trip, for last minute payment and reservation request contact Expedition Colombia. All payment must be done through our booking platform, or via a deposit in our Bancolombia bank account. All our prices above do not include IVA.